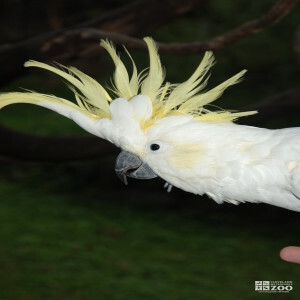 The range of the Sulphur crested cockatoo is Australia and New Guinea. The Sulphur crested cockatoo inhabits forests, woodland, mangroves, open country, agricultural land, and suburban areas. The incubation of their eggs is about 30 days. Sulphur crested cockatoos are usually found in pairs or small family parties during the breeding season, and at other times in flocks, sometimes numbering hundreds of birds. They are wary and difficult to approach. When the flock is feeding on the ground a few individuals remain perched in the tops of surrounding trees. At the approach of danger these "sentinels" rise into the air screeching loudly, and the entire flock flies off. The flight is erratic and appears slightly labored, with rapid, shallow wing-beats interspersed with glides on stiff wings. The courtship display of the sulphur crested cockatoo is simple and brief. The male struts along a branch toward the female. With his crest raised, he bobs his head up and down and moves it from side to side in a figure-eight movement, uttering soft, chattering notes. Mutual preening and touching of bills follow. In southern Australia the breeding season is from August to January, and in the north from May to September. The nest is in a hollow limb or hole in a tree, usually high in a tree near water. Eggs are laid on decayed wood dust, lining the bottom of the hollow. Both sexes brood. The young birds vacate the nest about ten weeks after hatching.